Gastón Ugalde (Born 1946) is known as "the enfant terrible" of the Bolivian Art Scene. He is a Latin American Artist recipient of the Konex Award in 2004 along with Oscar Niemeyer, and Venice Biennale 2001 and 2009. He is called "the most important living Bolivian artist" by the Konex Foundation in Argentina and is also referred as the "Andean Warhol" by art critics. 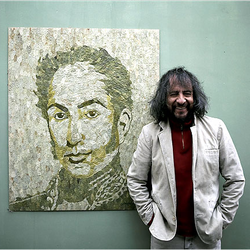 Gastón gained international notoriety with his controversial series of "coca paintings " that were given as presents to world leaders by Bolivian president Evo Morales. Gastón has been experimenting with coca in his art since the 1970s and for this special occasion, Gastón will be showing a series of never seen before coca paintings.